barnesandnoble.com, direct from the publisher or from all good book shops. thirteen black and white illustrations throughout the text. 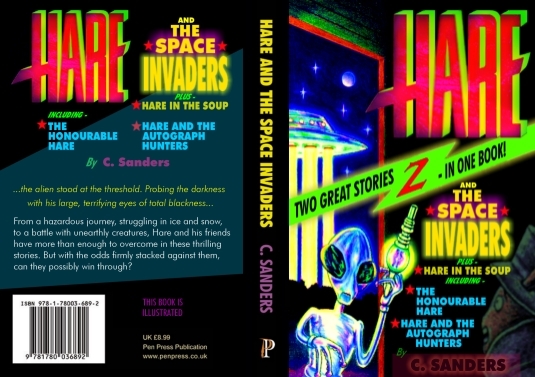 Hare and the Space Invaders is now available in eBook for Kindle! unbelievable value for money cost of just £1.99 UK and $2.99 USA/ Canada. Check your store for more details on the links below. There has never been a better time to enjoy a Hare book! 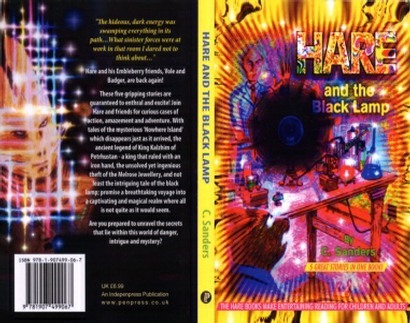 Hare and the Black Lamp is now available in eBook for Kindle! What are the Hare books? humankind on an Earth not too dissimilar to our own -is where it all takes place. Here, in a world of thrills and chills, the unexpected awaits. What a great book, full of adventure! -Mrs S.P. Loved the cover and book! -Mr E.B. Not what I expected -super! -Mrs L.W. Fun for all the family -Mrs D.P. Thanks for a smashing read -Mrs J.
I found it rather good, actually -Mr B.T. The brilliant Hare! -Mr L.J. Well done! Mr Sanders... -Mr B.
Wow! What a book! -Mrs D.
I couldn't put the book down! -Mrs P.
Really enjoyed it -fabulous! -Mrs M.H. Great story for the kids, and I enjoyed it too! 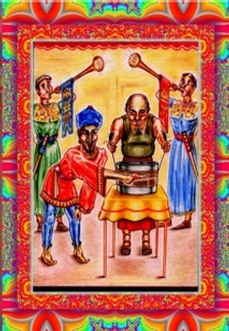 -Ms S.
The Hare Books make Entertaining Reading for all ages. Affordable hare stories in the UK. read the disclaimer at the base of the book page. to view and buy online at affordable prices. HARE NOW ALSO IN EBOOK! Book and e-Book purchases are made from this Home Page at absolutely NO extra charge! or the Green arrow further below. 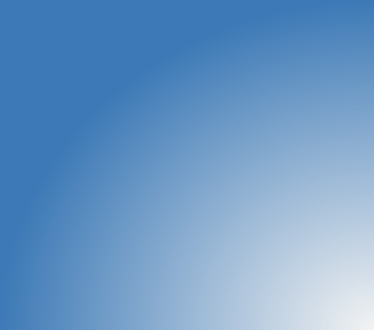 All books may be viewed by clicking on the green arrow below. The ‘Book Page’ is for limited preview purposes.